Christmas is by far my favorite time of the year. Growing up, I wasn’t thrilled to have my birthday on December 25th and sometimes had summer parties at my “½ birthday” instead since everyone was so busy during the holiday season. Now that I’m older and get to not only celebrate Christmas and my birthday, but Piper June’s birthday- December is an awesome month for parties and festivities. There is a little pizza place near our house that makes the most amazing truffle cheese bread that I can’t get enough of. They don’t deliver and the restaurant is next to a Central Market and other stores which are crazy busy this time of year with people doing their holiday shopping and you sit in an hour of traffic just to get there. This is an awesome party appetizer or side dish with just about any Italian style meal. Instead of waiting in traffic to make this for parties, I decided to try to make my own truffle cheese bread at home with easy ingredients from the grocery store. Truffle butter is easier to find and cheaper than you think. They have little 3 oz containers of if next to the normal butter for about $6. It makes a big difference to pasta dishes, or even top a tablespoon of it on a grilled chicken breast, yum! Pull butter out a 1-2 hours before making this dish to let it sit on the counter and come to room temperature. Put all ingredients (once butter is room temp) in a bowl and mix together into a soft paste. Cut the loaf of bread in half and spread all the mixture on both sides. Make sure you have plenty for a crowd, because people will gobble this up. This serves 6-8 people, but I have seen 3-4 people eat a loaf on their own because it is SO GOOD! I have written many different holiday inspired posts over the years and I thought it would be great to gather some holiday tips and tricks that I have shared in one post. Sparkly & Bright Holiday Party Outfits! Step one to celebrating the holidays with family and friends is to feel great in what you are wearing. Sparkles are always a must during the holiday months and there are so many great options, casual to a holiday date night out. I mean, the name says it all! 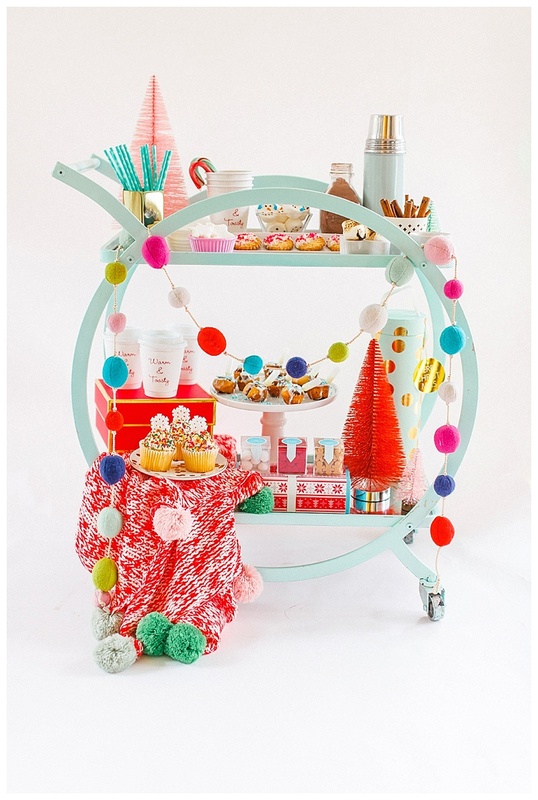 Swap your traditional bar cart for a hot chocolate set-up. Great for brunch and afternoon parties, gatherings with kids and always works perfect for dessert at an evening party. I’ll be sharing more from Piper’s first birthday party later in the month where there will be plenty of colorful holiday décor. There’s not many things cuter than adorable little girls dressed up and surrounded by treats and sweets.